A heavy hitter without the weight, the Light has everything the Don needs on his feet. With the articulated cuff and 3D molded tongue giving you a flex that's soft and forgiving, it's perfect for destroying any rail. The new heat moldable Comfort Fit Liner with micro fleece is cushy right out of the box and will keep your toes happy and warm all winter long. 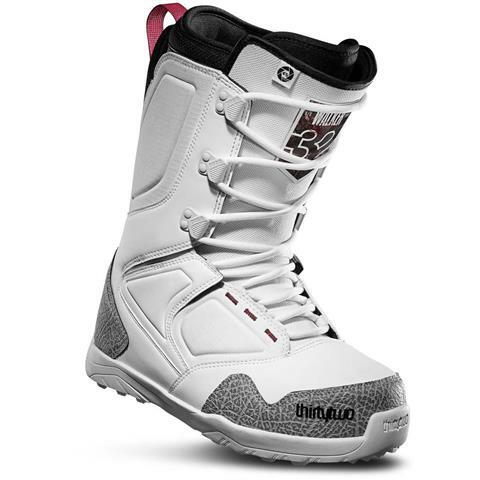 The Integrated Internal Lacing and Grip & Rip Heel Hold gives excellent hell lock while maintaining a soft flex. Updated with new molded footbed to keep you feet from shifting, soften hard landings with the Evolution Foam outsole. Heat moldible, super comfy boot, true to size, if your a sneaker head it looks like a Jordan! Very good boot all around with great flex.